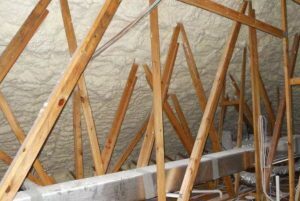 If you’re working with an installer like USI to provide spray foam insulation in exposed attics in the homes you’re building, you may have wondered how we decide between sugar foam and an alternative-tested foam. Both types provide your homeowner customers with the highest level of energy efficient building envelope, but each have their own challenges for the applicator. In every new project, we consider how to efficiently and properly provide a safe and high performance solution. Currently on the market there are two methods manufacturers are using in order to allow their open cell foam to be left exposed in an attic without an ignition barrier. The first method is what is referred to as sugar foam and the second is the original chemistry that has been used for years but tested under an alternative full assembly fire test. This post is an inside look at what we consider and the advantages and disadvantages of each method. Sugar foam uses sugar in the B-side. Sugar rises to the surface during application and in the case of a fire will char, much like a glazed ham, giving the foam a minimum of seven minutes of protection from ignition. This allows it to pass the industry standard NFP286 AC377 Appendix X test. Alternative tested foam is the same chemistry that has been offered for open cell for many years with the only difference being that the foam is not tested under the standard test protocol but rather an alternative full assembly test. This allows the foam to be left exposed in an attic provided there is an outward opening hatch or approved hatch panel connected to the occupied space. In the case of fire, the heat will build pressure in the attic assembly forcing the hatch or the panel to open outward into the living space releasing the pressure and oxygen and re-closing starving the fire of oxygen. Once again giving the foam a minimum of 7 minutes of protection. An attic assembly above 40,000 ft.³ would require additional criteria to be met such as encapsulating all ducts and vents that connect to the outside of the building envelope with foam. In this scenario, you would need to contact the manufacturer of the product to get clarification of the requirements. Both sugar foam and alternative tested foams provide the customer with the highest level of energy efficient building envelope but each have their own challenges for the applicator. Sugar foams present proper processing and maintenance challenges while alternative tested foams present challenges with hatch placement, building inspectors’ understanding of the ignition barrier requirements, and a general understanding of when other criteria are met. So ultimately we decide which challenges we are best fit to overcome in order to efficiently and properly provide a safe and high performance solution. For more information on meeting codes with spray foam insulation, contact your local branch. USI believes in excellence in every step of the process and ensures timely completion and quality of service, time after time.